. Memorial Day for Kawahigashi Hekigoto 河東碧梧桐 . Kan-ake Ki 寒明忌 "Day when the cold ends"
. hatsu tsuitachi 初朔日 first "first day" .
. St. Bridgid's Day - Ireland .
. Setsubun 節分 beginning of Spring .
. Kasuga Shrine Lantern Festival 春日の万燈 .
. risshun 立春 beginning of spring . Memorial Ceremony for the 47 Samurai . celebration of the 26 saints .
. Kumano Kamikura Shrine Torch Festival 御灯祭 .
. National Foundation Day 建国記念日 .
. Valentine's Day バレンタインデー .
. Serbia National Day .
. Memorial Day for Ryokan 良寛忌 .
. usui 雨水 rain water .
. Memorial Day for Naito Meisetsu 内藤鳴雪 .
. Memorial Day for Courtesan Yugiri 夕霧忌 .
. ninja no hi 忍者の日 Day of the Ninja spies .
. George Washington Birthday - USA .
. Goa Carnival - India .
. Family Day, Alberta Family Day - Canada .
. WKD : February - a Haiku Month .
. WKD : World Days in February .
. Ceremonies, festivals, rituals - February .
. Memorial Days of Famous People - February . Daisen is a sprawling city in the south of Akita, famous for its fireworks, rice wine, baseball obsession, winter festivals and many other unique attractions. Up until around 30 years ago, each village would hold their own small separate celebration of the 14-16th days of the lunar New Year. The Ota Fire Festival has brought all of those together into one joint event, and is held on the fourth saturday of February every year. "Rice planting in the snow" to pray for a bountiful harvest. 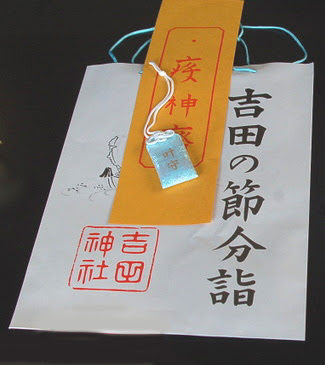 There is also "Tenpitsu yaki 天筆焼き", a ceremony where people write their wishes and desires onto brightly coloured pennants and then fling them into a fire. If the ash floats up from the fire and drifts a long way away then it means their wish has a good chance of coming true. 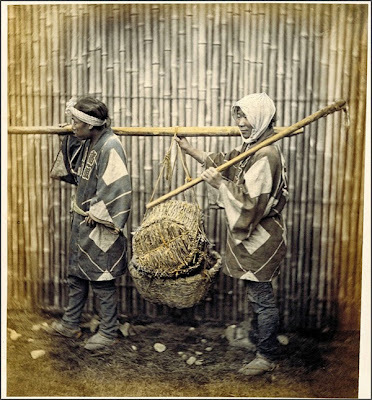 Two groups of fearless men, from the North and the South, dress in protective gear and grab long bamboo poles. They line up in two lines, separated by the lenght of the bamboo poles. They now start hitting the ground and each other, until most of the bamoboo is broken. The match is held in the evening, with huge bonfires for light. The winning team is the answer to the prediction of a good harvest in the coming year. In the Tea Ceremony school of Yabunouchi, the five senses are entertained. With the ceremony of laying out the charcoal for boiling the water, the master and the guests gather at the open fireplace and enjoy not only the different colors of the charcoal, but also the warmth of the embers. The ashes where the charcoal is placed are also layed out and forked into special patterns. with a feather, habooki 羽箒. The coal is layed out in a special pattern. The pieces have various size, the biggest for holding the warmth during the whole ceremony, the smallest for picking up fire quickly and some long ones for transfer of the glow to the larger piece. 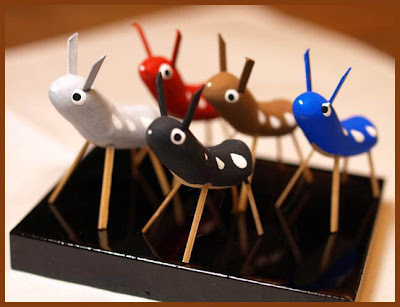 Some twigs of white charcoal are also use, they make a fine decoration to enjoy with the eyes. The faint clicking of the burning embers is a joy for the ears. After laying out the coals, the meal is served and then after a pause, the tea is served. Just watching the arrangement and seeing the embers, feeling the warmth, makes the heart quiet and brings enjoyment to the group. Here the master can show his skills, since the coals burn different at any time. The tea ceremony as an art form cuts through a whole spectrum of Japanese culture because it embraces many art forms such as architecture, gardening, ceramics, textiles, Japanese calligraphy, flower arrangement, and Japanese cuisine, plus a few rather arcane art forms such as the sculpting of ashes and the building of a beautiful fire. Certain arrangements of ashes on which charcoal is placed can take as long as two hours to prepare. Other than the Japanese tea ceremony, where else can you find humble ashes raised to such a level of refinement and beauty? Indeed, they are the finest ashes in the world. A story is told about three tea masters who had a magnificent tea room with much valuable equipment. One day the house caught fire and the 3 tea masters rushed in to save what they could. The first thing they saved was the ashes! The point being made with this story is that everything involved in a tea ceremony has been given careful aesthetic attention, even the ashes. People paint their faces black and pray for health. Especially in Niigata at Tokamachi town. There it happens after the ritual of throwing young husbands of the last year down the slope of the tempel Yakushi-Do (mukonage 婿投). It is also common in other parts of Tohoku, expecially the Date region of Fukushima. Used just like that, the word is not a kigo and can apply to various kinds of ashes, see quote below. But there are some compounds with it as kigo. In Japan, most dead bodies are cremated and the ashes toghether with some bones are handed over to the family members. 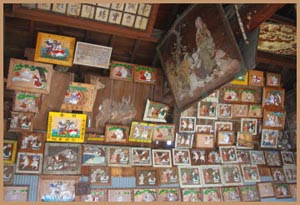 They are kept in special "bone containers" (kotsutsubo 骨壷) and placed on the family altar at home or in a grave. Ash (analytical chemistry), the compounds that remain after a scientific sample is burned. - Let us take a time trip to Edo !
. Recycling and Reuse in Edo - リサイクル と　再生 . 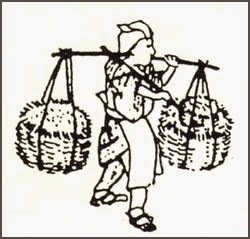 Wood and straw was the most common burnable material in Edo. Considering there were about 1.000.000 people living in the city, a lot of ashes were produced every day. 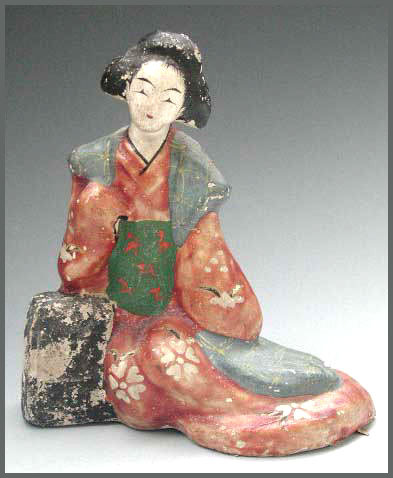 Ashes were used in many ways during the Edo period. 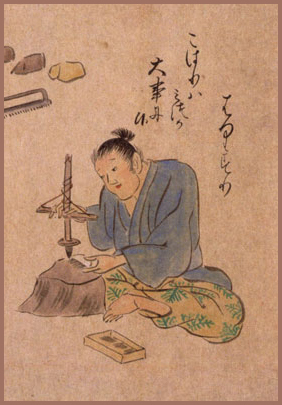 Some examples are the indigo dyers, paper makers, sake and silk producers, furniture makers and others. Furniture makers used it especially for cleaning a surface. 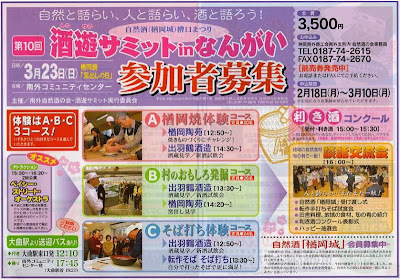 The buyers for ashes of the kitchen fires and hibatchi heaters walked around the cities and then sold their ware at special "ash markets", for example in Kawagoe and in the suburbs of Edo. 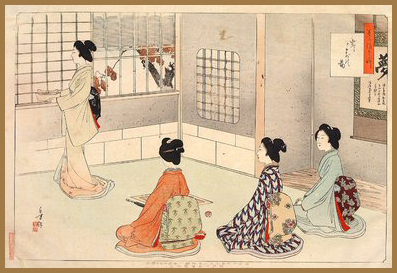 In Kabuki there is a famous saying, to express the "most trivial things"
In Edo, the ash buyers wanted only the pure ashes. They brought their merchandise to a special ash dealer or merchand 灰問屋 (haidonya), got their money and spent the rest of the day happily. 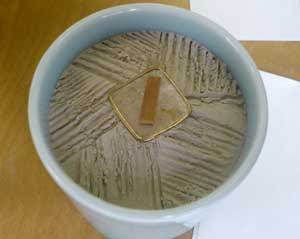 One of the rich ash merchands was Haiya Juuyuu 灰屋紹由 Haiya Juyu.
. . . CLICK here for Photos of Ashes ! Usually, unperfumed rice-ash is used. 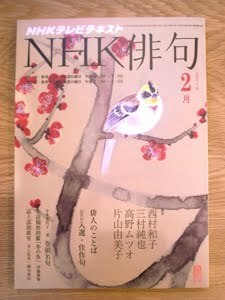 It is carefully layered and finally raked into patterns 灰の模様, (hashime 箸目) sometimes a different one for each month. There are special tools to rake patterns into the ashes. 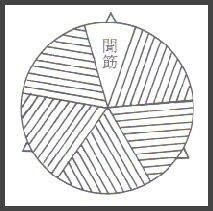 The ashes can be divided into six fields or three fields in the form of the letter V.
white ash for soradaki 空薫（そらだき) "burning for pleasure"
They are made from coal powder of wood or bamboo, kneaded with natural glue from seaweed (funori) . After forming the balls they are dried. When carrying normal charcoal in bundles, there is always a lot of powder at the bottom of the package, which was used to make the balls. They are now so powerful as heating material, but keep burning for a long time. 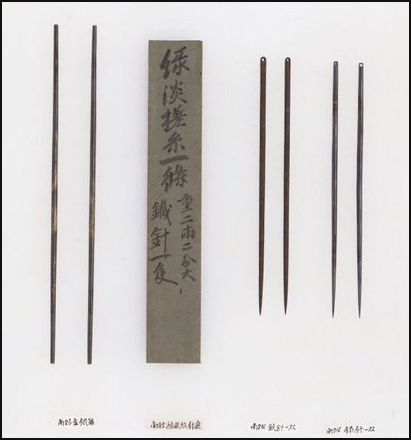 In the Edo period, Shiobara Tasuke 塩原太助 mixed them with glue from seaweed to make them even more useful. Starch from potatoes was also used to stick the bits and pieces and powder together. Before the advent of heating oil they were use for heating and in cooking stoves and hibachi. Charcoal balls used for Kodo 香道, the way of fragrance, are made from expensive wood charcoal powder and rolled into longer sticks. They are quite different from the tadon for heating. Since they are black, they are a symbol for loosing a bout in sumo (kuroboshi 黒星). four and a half tatami was a standard size of a room for the tea ceremony. To the four-and-a-half mat room. when Basho stayed at the estate of Bokusetsu 木節.
. Juteini 寿貞尼 Jutei-Ni .
. Hirose Izen 広瀬維然 .
. Kagami Shikoo 各務支考 Kagami Shiko . A doctor from Otsu, also known under the name of 是好. He was one of the few who saw Basho on his death bed. 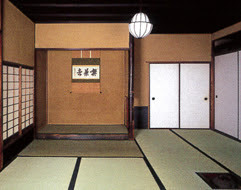 chashitsu 茶室 Tea Ceremony Room. after a fire, there are ashes on the ground. 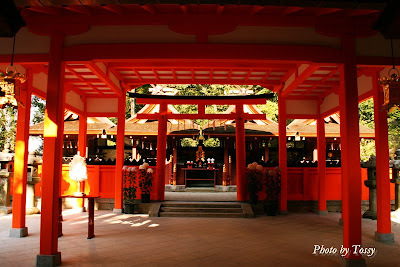 The Kasuga Shrine (春日大社, Kasuga-taisha) is a Shinto shrine in the city of Nara, in Nara Prefecture, Japan. Established in 768 A.D. and rebuilt several times over the centuries, it is the shrine of the Fujiwara family. The interior is famous for its many bronze lanterns, as well as the many stone lanterns that lead up the shrine. 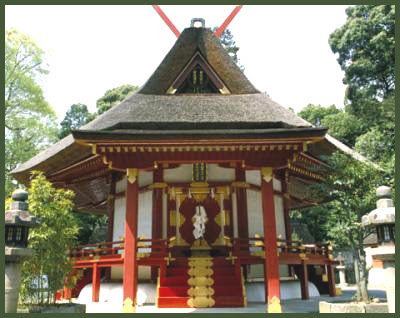 The architectural style Taisha-zukuri takes its name from the Kasuga Shrine. Kasuga Shrine, and the Kasugayama Primeval Forest near the shrine, are registered as a UNESCO World Heritage Site as part of the "Historic Monuments of Ancient Nara". The enchanting path to Kasuga Shrine passes through Deer Park (where tame deer roam free). Over a thousand stone lanterns line the way. Kasuga jinja 春日神社 Kasuga Shrine is the shrine name. Also called ooyashiro-zukuri. The oldest style of shrine architecture. This festival takes place at the Great Shrine at Kasuga, Kasuga Taisha 春日大社. More than 3000 lanterns are lit up in the cold winter night. 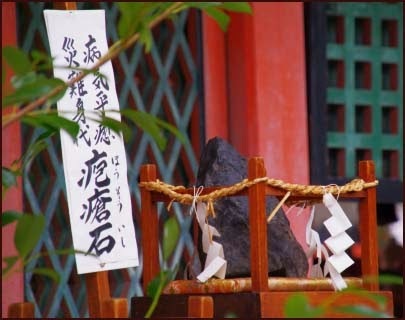 The stone lanterns have been dedicated by some Daimyo of the Edo period and many more by the lay people who come visit this shrine. There are also many bronze lanterns hanging from the eaves. This ceremony is more than 800 years old. During the O-Bon festival, the lanterns are lit again. The shrine was build in the 2nd year of the Zingo-Keiun era (768) and its festival was held on the first "day of the monkey" (saru no hi) in February and November (old lunar calendar). In the Meiji period, this day has been declared to be on March 13. 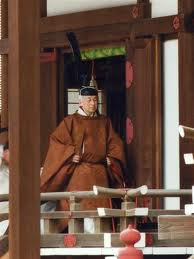 An imperial messanger makes offerings to the deity and many Shinto ceremonies are held on this day. 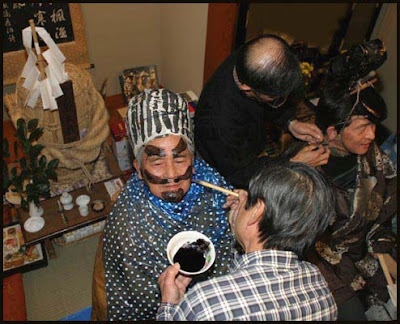 One of the three great festivals by order of the Imperial court (san chokusai 三勅祭) of Japan. Usually the deer get small bisquits from the tourists, but on this day large ones with a diameter of 25 cm are made for throwing and fighting about the longest flight of a bisquit. Sometimes they throw it for more than 50 meters. The winner gets a pair of the cut-off horns of a Kasuga deer. In October, the divine deer are all gathered in one place and the horns are cut. This will prevent the animals from hurting each other and hurting the many visitors in Nara. 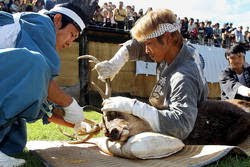 The deer are rounded up and the first cut is made by a shinto priest of the shrine. This ceremony started in the Edo period and is performed to this day by a group of about 25 professionals. This festival is handed down since the 12th century. It started during an epidemic, when the government had rites performed at the "Young Shrine" Wakamiya, to pray for improvement and also for a good harvest. The biggest event is now held on December 17, with a long procession of people dressed in period robes of the past, from the 9th to the 19th Century. Traditional music and dance are also performed during these festival days. A ritual to pray for a good harvest. At the three shrines Ringo no niwa 林檎の庭, Enomoto Jinja 榎本神社 and Wakamiya shrine 若宮社 men perform ritual planting dances and women plant pine needles (representing rice plants) as an offering to the deities. The colorful dances and lively songs are a joy. Wakamiya, chigo or dooji indicates a divine boy (in case of Kasuga an incarnation of Monju Bosatsu), Bodhisattva of wisdom. On this scroll, a sacred tree (sakaki, Cleyera japonica) stands on the back of the white deer, which is the messenger of the Deity of Kasuga. Kasuga shrine has four main deities and the one of Wakamiya (the New Shrine) is seen as Buddhas standing on the branches. There are also wisteria blossoms (fuji), the symbol of the shrine and the Fujiwara family. The top part of the mandala shows Mount Mikasa in front of the Kasuga hills. They come in all sizes and with all kinds of paintings. There is a special hall to exhibit them all. The "Great God of Kashima" rode on a white deer from Kashima all the way to the Kasuga shrine in Nara as a divine messenger, and the deer became the symbol of Nara. The Kasuga Deer Mandala tells the story. 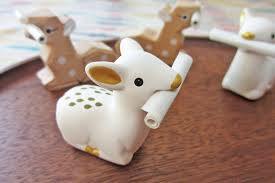 These deer are only about 2 cm high, made with bamboo legs. They come in five colors and have white dots on their body.
. Goshiki Daruma and Color Symbols .
. hakuroku 白鹿 white deer mikuji . It holds all the deities of the Kasuga Shrine in Nara, just closer to Kyoto. hoosoo ishi 疱瘡石 "smallpox stone"
In the beginning of the Heian period, the wife of Junna Tenno 淳和天皇 (786 - 840), 崇子内親王 Takako Naishinnoo, suffered from smallpox and made a vow to this stone. So the stone took on the smallpox and the lady was cured. Now people come to pray for good health. 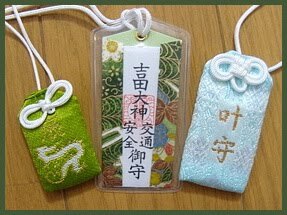 In October there is also a festival with mikoshi palanquins, praying for good health and a good harvest.
. byooma taisan 病魔退散 warding off disease .
. Health Amulets 健康御守 kenkoo omamori . mehr als die vom Menschen. 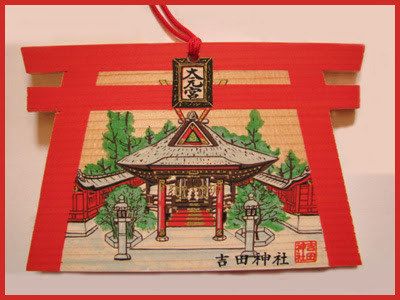 "the green and cinnabar is good"
This is an old makurakotoba for the old capital of Nara. 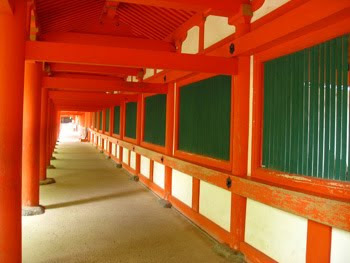 The red pillars and green window bars of the shrine are auspicious colors to keep evil out of the city. Many temples and shrines were built whith these colors, so a walk in Nara was yoshi, was pleasing and this expression became synonymous with NARA (Heijokyo 平城京). 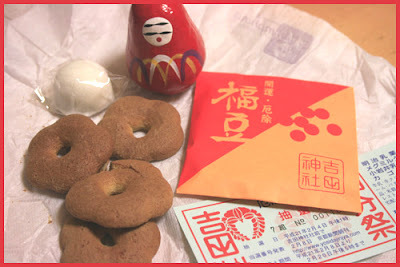 There is also a famous sweet from Manshodo 萬勝堂 of this name. 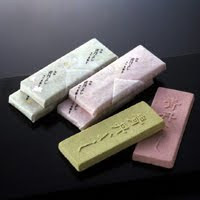 It is made of wasanbon sugar. Kasuga Ryūjin (春日龍神), or "The Kasuga Dragon God,"
is a Japanese Noh play often attributed to Komparu Zenchiku, son-in-law of Zeami Motokiyo. The play features the historical figure Myōe Shōnin (1173 – 1232), abbot of the Buddhist temple Kōzan-ji, and famous for his detailed dream diary. Myōe sought for many years to visit China and India, and to witness the places where the historical Buddha preached; in episodes recorded in his dream diary and other sources, Myōe is said to have been visited, both in dreams and via oracles, by the Dragon God of Kasuga Shrine, who persuaded him to remain in Japan. The play is inspired by and based upon these sources, and relates one such meeting of Myōe with the Dragon God. The play opens with Myōe and his companions traveling to Kasuga Shrine to say formal farewells to the kami of the shrine, before they leave for their journey to China and India. There, they meet a priest, an old man, who welcomes them into the shrine grounds, saying that Myōe is favored by the kami of the shrine like a first-born son, and that of course he should be most welcome. Learning of Myōe's intentions to journey abroad, however, he argues that the kami shouldn't like to see him go, as his presence at the shrine is so treasured. The priest goes on to explain that, were the Buddha still living, one would do well to hear him preach in person. But, he says, the ages have turned, and the sacred places of India and China are now represented in Japan. He equates important Buddhist sites such as Vulture Peak to sites in Japan, such as Mount Mikasa, and encourages Myōe to visit these sacred sites instead. He offers that if Myōe will desist with his plan, he will reveal to the monk, upon Mount Mikasa, the five regions of India, the Buddha's birth, the Buddha's enlightenment, his preaching, and his passing. Convinced, Myōe gives up his intentions to travel to the continent, and asks the old man his name. 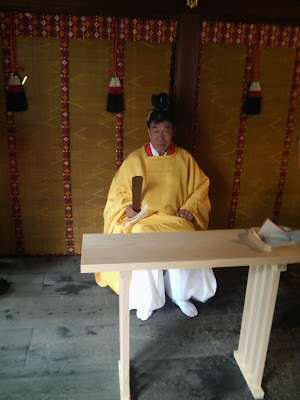 The priest identifies himself as Tokifū Hideyuki, a name drawn from those of the founders of the Kasuga Shrine, Nakatomi no Tokifū and Nakatomi no Hideyuki, at which he vanishes. Between the two acts of the play, a kyōgen actor portraying a minor kami in the service of the shrine comes forth and retells the story of the first act. 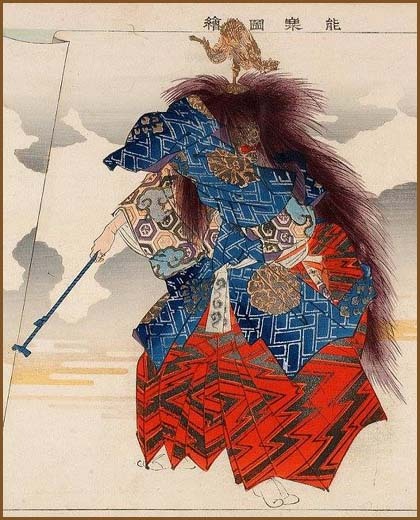 In the second act, the Dragon God of Kasuga (the kasuga ryūjin of the play's title) appears, and dances, while speaking to Myōe, and confirming that he has in fact given up his intentions to journey to the continent. comprizes the five kami of Kasuga related to the temple Kofuku-Ji. Based on the honji suijaku doctrine, separate Buddhist avatars (honjibutsu) were designated for Kasuga shrine's Shisho Myōjin, "Four Bright Kami," and Kasuga daimyōjin the collective name for the "Four Bright Kami" and the uber-kami that those four comprise was considered a Shinto manifestation of the Buddhist Boddhisattva Jihimangyō Bosatsu. 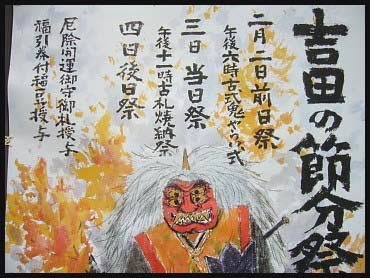 Saint Enchi's parents did not have any children, so they prayed to Kasuga Myojin. In a dream he let them know that soon they would have child with a special curse. Eventually a baby boy was born and the husband made offerings to the Deity. Just then lightning struck the house and almost the whole family died. The mother became blind and eventually left the child in the wilderness of the pilgrims road to Kasuga Shrine.
. 円覚上人 圓智上人 Saint Enchi (active in Tsugaru around 550) . In the village pond lived a Dragon who ate peopoe, so they tried to drive it away. They lit a fire at the dam of the pond and tried to scare it, but the Dragon did not appear. 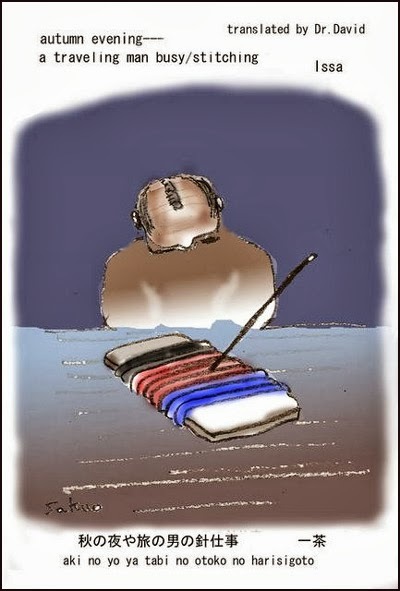 A Samurai, who walked past, shot an arrow in the pond. The Dragon grabbed the Samurai and flew with him up to heaven. Eventually it begun 雷光 to thunder ad flashes of lightning appeared. Blood-red raindrops fell into the pond. Eventually the body of the dragon dropped into the pond, all torn with wounds. The villagers collected the Dragon bones from the pond and made a statue of a Dragon. 春日明神 the Deity Kasuga Myojin. Along the 新笠置街道 New Kasagi Road there are two large footprints in a stone wall. They say they are the footprints from the White Deer which Kasuga Myojin rode when he came from Kashima.